We are honored to announce the honoree for our 17th annual Paving the Way Gala benefiting our programs and services for young people experiencing homelessness! The gala will take place on Friday, March 22nd at 6:00pm at the Four Seasons Hotel San Francisco. Tickets are on sale now and include a cocktail reception, dinner, awards ceremony, and after party. 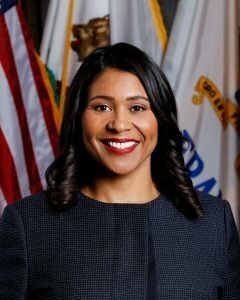 This year, we have the distinct pleasure of presenting esteemed Mayor London Breed with our Anne B. Stanton Award. Anne served as Executive Director of Larkin Street from 1994 to 2003, and this award in her honor intends to celebrate her innovation and fearlessness in addressing youth homelessness. No one better exemplifies these traits than our honorable Mayor, London Breed. Mayor Breed has been a consistent, impassioned advocate for young people for years. As Supervisor of District 5, Mayor Breed actively championed additional services for young people experiencing homelessness across the City and in the Haight. During her time as Mayor, London Breed identified homelessness as a platform issue and has put youth at the forefront once again with her Opportunities for All initiative aimed at providing paid internships and job-training opportunities for San Francisco students. Perhaps most significantly, this past August, Mayor Breed announced her Rising Up Campaign, a public-private partnership aiming to cut youth homelessness in half by 2022. The campaign will serve 500 Transition Age Youth (TAY) who are experiencing homelessness as well as prevent homelessness for another 450 at-risk TAY. We thank Mayor Breed for her continued dedication and commitment to San Francisco’s young people. We thank Mayor Breed for her continued dedication and commitment to San Francisco’s young people. The Paving the Way Gala brings together more than 400 Larkin Street supporters, donors, volunteers and community leaders who “paved the way” for Larkin Street since the organization’s founding in 1984. The event highlights Larkin Street’s legacy – reaching more than 75,000 of San Francisco’s most vulnerable homeless and at-risk youth ages 12 to 24 – while also looking forward to the organization’s future. Since 2003, the Paving the Way Gala has raised over $10 million to benefit Larkin Street’s housing, education, employment and physical and mental health programs.